Read your messages WhatsApp in incognito mode and hides the double blue tick. No confirmation read, without blue ticks, without verification ticks or information about your last visit. In recent updates, WhatsApp presents the state "Last time" And double blue tick. 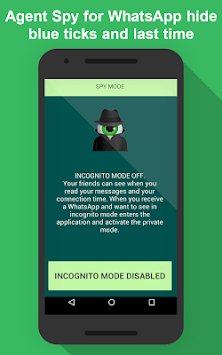 Without the incognito mode, your friends always know when you read your messages. 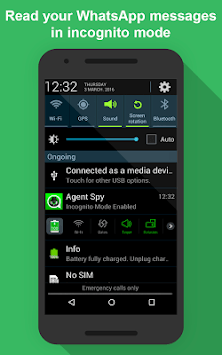 With Agent Spy your friends can not see that are using WhatsApp and reading messages just sent you. - With activated incognito mode you can hide the double blue tick, confirmations and status read "last time." - Read WhatsApp messages anonymously. 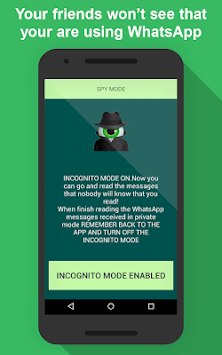 You can safely read your WhatsApp messages with the help of incognito mode. Your friends will never know if you read your messages or you were online.